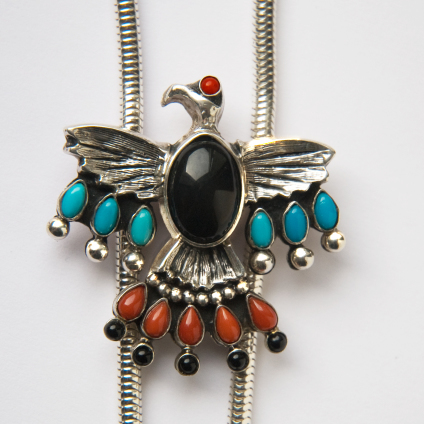 Bolo tie symbolizing a Thunderbird, bringer of fertility and rain. *Shipping costs included, US and Canadian tax rates excluded. Price depends on current Euro-dollar exchange rates. Along with aadizoogaanag or grandfathers of the non-human category, the cosmos as the Anishinaabe forefathers conceived it was densely populated by countless manidoog, or mysteries (spirits), mystical forces that are sources of sacred power suffusing and animating all things on earth that were created naturally. However dangerous some of these manidoog may have been to human beings, they weren’t necessarily considered evil beings. In Anishinaabe thought there is no sense of good and evil but only a natural balance of deeds: nature, however symbolized, qualified, or ritualized, simply exists. Giizhigoong is how the Anishinaabe ancestors called the Sky World and all of its beings, corporeal as well as incorporeal. These grandfather-beings were symbolized by Giizis the Sun, Dibik-giizis the moon, anangoog the stars, and by gimiwan and animikiiwaanakwadoon (rain and thunderclouds) which represented the physical orders of the universe. Another class of Sky Beings was represented by bineshiwag, or taloned birds of prey. The first of these grandfather-bird species that comes in mind is Migizi (the bald eagle). With his sharp vision and ability to soar high in the Sky World, Grandfather Migizi represents all big predatory birds, and he is known as an intermediary between the Anishinaabeg and the manidoog and aadizookaanag of the Sky regions. Giniwag – golden eagles – and Gekekwag - hawks - who are often regarded as the natural counterparts of the supernatural Thunderbirds, also play an important metaphoric role in the world of the Bird Nations. 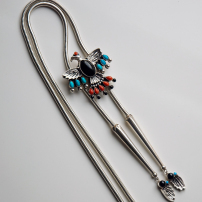 The sterling silver bolo tie, featuring a black onyx body (black is the color of the West where the thunderbirds live), wings that feature turquoise stones (symbolizing the sky and the lakes), and a tail from which coral cabochons and black onyx stones spring (symbolizing respectively the earth and the underworld), is modelled after Giniw the Black Headed War Eagle (golden eagle), Spirit Keeper of the east. Thunderbirds, which come in different sizes, have always been considered the most powerful of all manidoog and aadizookaanag. They are known to live in nests of stone on high mountain peaks enshrouded by dense clouds and to migrate with the birds that appear in spring and disappear in the fall. They assist the Anishinaabeg by driving away the ominous earth and water manidoog. Thunderbirds and the misi-ginebigoog or Sea Serpents of the lake are adversaries; in fact, Thunderbirds feed upon the great horned Sea Serpent of the lakes. The battles between Thunderbirds and the mishi-ginebigoog often result in raging waters and seething storms. 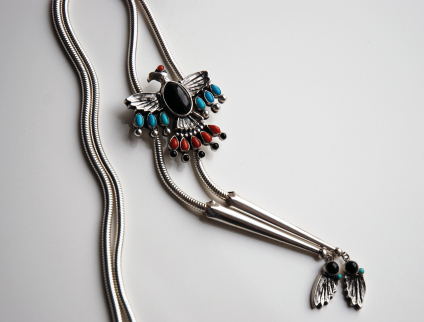 Graphically, connecting lines from Thunderbird feathers sometimes run from the wings, illustrating the knowledge and power given from above, to those below; jeweler Zhaawano expressed this sacred connection between the sky and the earth and underworlds through the blue, red, and black stone and coral cabochons that adorn the bolo tie that you see on this page. 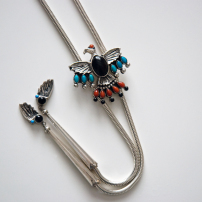 The sterling snake necklace cord attached to the back of the bolo slide and the eagle wing bangle tips attached to the ends of the cord symbolize the Underwater Snakes and the dualistic relationship that exists between Underwater Snakes and Thunderbirds, and, in a wider sense, between all living beings in the Universe. According to tradition the Thunderbirds came to earth in the beginning of times to govern the quality of man’s existence, and that of the animals and plants, with supernatural powers over which the Anishinaabeg had little or no control. Thunders became thus associated with fertility, and with the creation of clouds and rain. Thunderbirds are also said to perceive what lives in the hearts of human beings and to punish those who have impure thoughts and live immoral lives. From another aadizookaan, the sometimes foolish but also wise teacher Wiinabozho, the Anishinaabeg learned to offer the sacred asemaa (tobacco) to the thunder Grandfathers. An act that became a customary rite through the ages and that is still practiced today. “When a vision comes from the thunder beings of the west, it comes with terror like a thunder storm; but when the storm of vision has passed, the world is greener and happier; for wherever the truth of vision comes upon the world, it is like a rain. The world, you see, is happier after the terror of the storm." - Heȟáka Sápa (Black Elk), Oglala Lakota wičháša wakȟáŋ.